Glycostat is an intravenous sensor specifically for tight glycemic control (TGC) in the critical care market. 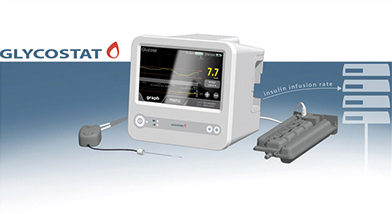 The Glycostat system is intended to continuously measure, record and track the blood glucose level (BGL) in critically ill patients (i.e., those patients under intensive-care treatment within an ICU) and to provide appropriate alarms in case of hypo- and hyperglycemic readings by the device. In addition the Glycostat system is intended to keep the blood Glucose level within set limits by giving advice on needed insulin infusion rate. interface to an insulion infusion pump is foreseen. Flowsion is a medical device company focused on the design, development and commercialization of a product platform specifically for the in-hospital automated glucose control. Experienced Management Team – The Company’s management team is comprised of highly experienced executives combining over 30 years of experience in successfully growing companies. Flowsion has just received approval of the GLUCOSTAT project under the EU SME programme. In that respect Flowsion will over two years receive a grant of m€ 2.5.